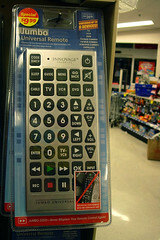 This gigantic remote control is the funniest thing I've seen all month. Every time I look at this picture, I start laughing in a way that might cause people to send me off to a padded room. the pricetag is about the size of a half-dollar! It would take up half of my coffee table! The only thing funnier would be seeing a tiny old person trying to use it.